A somewhat larger than expected number of new wells started production in March (63, which was one more than in Feb). Wells that started production since the 2nd half of 2015 stay, on average, longer on an elevated level than earlier wells. By month 8 many are still producing around 300 bo/d (or are on a path to produce that much), compared with 200 bo/d for a typical earlier well. You can see this most clearly see in the “Well quality” tab (using the filter to only see wells since 2015) and then to group by “month of first flow”. Only 31 wells were spud in March, the same number as in February. Although the number of newly producing wells declined each month (on a per-day basis) for the last 4 months, the decline in rig count was far sharper. This has eaten into the DUC inventory recently. So far 2016 vintage wells track the 2015 wells very closely. All major operators are showing declines in March (see “Top companies” tab). XTO (not shown there) however showed a big increase in production during 2016. It appears that Continental Resources didn’t put any new wells on production after November. Whiting started just 12 so far this year. XTO has been most active the first quarter with 52 wells, followed by Hess with 30. Around May 21/22, I plan to post another update on the Eagle Ford. Less than 1% drop. If it keeps hanging in there like that, may straggle across the year without dipping below 1MM bpd. (ND total, not just Bakken/TF). “Wells that started production since the 2nd half of 2015 stay, on average, longer on an elevated level than earlier wells. By month 8 many are still producing around 300 bo/d (or are on a path to produce that much), compared with 200 bo/d for a typical earlier well.” Do you mean slower decline? Or just better initial production? It does start to emerge that wells since the 2nd half of 2015 behave differently than before. 3. Group by quarter or month of first flow. A few companies stand out in how their wells have changed. You can see this most clearly by filtering on each of these (leaving the group by quarter/month). By choosing all, and excluding these companies, you can see that the average well profile looks much more normal again. It’s a very interesting development. As we have seen in the past that flow rates start to converge after 1-2 years, I am most interested to see whether that still holds for these wells. I wonder if it is something simple like high grading. The slower decline is very puzzling though. I know you don’t follow gas production, but I see gas production reached another all time high, along with the falling oil production. Take your pick, time will tell. I’m also following the gas production, but it’s not included yet in the presentations. Indeed GOR has been rising quite a bit. 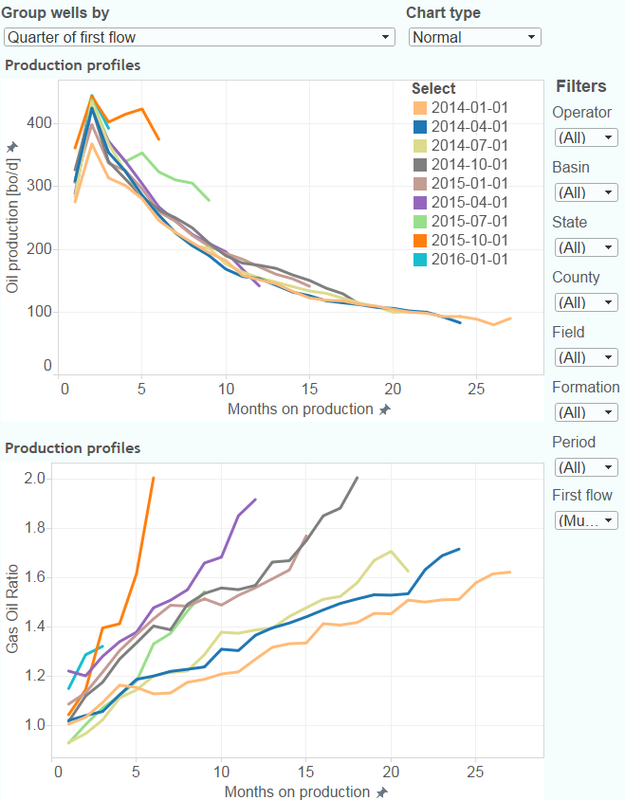 The following picture shows above the normal oil production type curves, for wells since 2014, grouped by quarter. Below that is the GOR shown for each of these groups of wells. Thanks for the graphs. So it is established that the GOR in going up in the newer wells, but there are many reasons why this could be so, particularly between different companies and there operations. It will be interesting to watch and see if/when the production rate of newer wells drops below that of the older wells, and then the cumulative production? Just a comment to say thanks for the amazing work and resource. Great to hear that, thanks Alex. The center of the basin, where drilling and completion have moved, is well known to be deeper and gassier. In addition, improvements in gas capture infrastructure continue. It’s kind of hard to prove a negative (open choking not happening), so I think those who think it is should do a little more to say why. Right now, the only thing supporting the view is higher than expected (by you) total oil production, and higher gas percentage. But there are no mainstream analyst reports (reporters, banks, conference calls, drilling info blog, etc.) supporting the open choke theory. Just be careful of going down a self-reinforcing belief when you are just speculating on a peak oil blog. Hi, everyone. Really great results. I was hoping that you could speak a little bit more about better performance you see in the Bakken. From what I’ve seen looking at the state data, the recent wells seem to exhibit a relatively flat production period for several months. So would first like to know if that’s what you’re seeing? And if so, what would you attribute that to? Well, Drew. It’s a good quick question. It all boils down to essentially the enhanced completions that we’re doing in the Bakken. These wells are outperforming our expectations, as a result. We completed wells in 2015 with our enhanced completions. And we’re early in these wells, because obviously they’re coming on here first of the year. I think we put 10 wells or 11 wells that were completed in 2015 on early part of this year as well as obviously the ones completed late last year. And with early time performance, it’s really hard to project what they’re doing and what we’re seeing is these wells have a much flatter decline that we expected and producing at higher rate. So it’s a great situation to have. Essentially, we’re seeing better performance from a Bakken enhanced completed wells than anticipated. I have never stated that chokes have been opened too far. I have have always raised this as possibility/probability that they have. Human nature, says people will do anything in the short term where their very existence is threatened, despite the long term consequences. Is you can’t survive today, why worry about next year? Do you think a CEO in a company presentation, is going to admit that they are acting in short term destructive manner and neglecting the long term consequences? I don’t think so. It is much better to watch their actions, rather than listening to what they are saying. I may be totally wrong about their choke operation, I maybe half wrong as well, as in some companies do the right thing and others do the wrong thing. Increasing GOR can be explained by several things, but decreasing reservoir pressure below bubble point is at the heart of the issue. Why that pressure point is being reached is open for debate. As we are all in agreement that GOR is increasing, the next step will be how production fares. If longer term production of the newer wells can stay above the older wells, we can put increased GOR down to gassier formation, but if it drops below, then we need to look at how the individual companies have operated their wells? I listened to the released NDIC webcast. Lynn Helms mentioned that in the core the GOR is 2 to 4 times higher than in other areas, and that that explains the rise in gas production. He still expected bigger declines in the coming months, and output at or below 1 million by year end. What most stroke me about the new wells, was the ‘unnatural’ shape (compared with earlier completions) of some of the profiles. Check out for example Burlingtons wells in 2015, grouped by quarter. Several quarters show first falling production, and then a rise higher than the original peak. I haven’t seen these kind of shapes on an aggregate level before. In the past, well profiles have converged strongly by month 12-18, so we’ll have to wait a bit more to see whether these wells actually behave structurally differently. 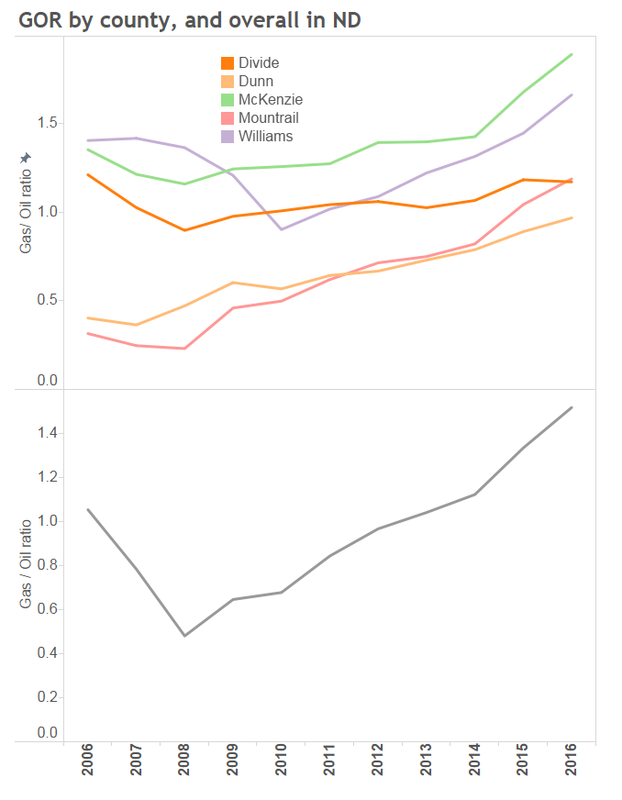 I may have a look once to see whether within certain areas the GOR has been rising compared with earlier. I did have a look at the total GOR in ND, and within the main counties. As you can see, there has been a rise in GOR already for some years, even within counties. So the explanation given by Lynn Helms, that the rise in GOR has been due to the move to the core, doesn’t fully explain this increase. I get the rationale. However, there also definitely has been a movement (just look at the rig map) into the center of the basin. Bakken is a bowl and the center is deeper and gassier. Maybe both effects are going on, but there’s pretty strong evidence of the latter (movement to the core). You seem to be pretty reserved here. Would just be wary of the sort of reinforcement that tends on a place like POB. There are good analyses at times (Alex, Dennis, Enno). But there are also a lot of guys there that are always jumping to conclusions and always in a certain direction. [Enno: Rest of comment removed. Nony, please no attacking of people (even on other sites) here, let’s just focus on sound arguments]. Your attachment is not showing (looks like little faint thingie). Can you calculate how much of the change is from movement to gassier regions, how much from other causes? Also, need to consider the impact of well age on GOR; some types of wells change GOR over time. Obviously the population of wells is getting older and we are also having less new completions per month than during the boom. For Burlington, look at the total oil produced by year. There is a pattern of declines and then rises for the 2013, 2014, and 2015. Maybe some sort of decision not to do completions in winter? You would think it wouldn’t show in the individual wells, but there could be an impact that feeds through in terms of less days off line in the winter (when the secure nearby wells to complete one). P.s. The big decline for all years in early 2013 looks like a divestiture. COP bought out Burlington Resources a few years back but kept the name and organizational structure somewhat similar to what Exxon did with its acquisition of XTO. Regarding your comment awhile back about not seeing the term ‘halo effect’ via Google, industry people do not use that term and, in fact, seem to almost never discuss it publicly. It is not only recognized that hydraulic communication occurs between wells, and frequently boosts production in the offsets – sometimes dramatically – the produced water also increases in the offsets. This is proof positive that it is occurring. With the increased use of slickwater (the less viscuous nature playing a role), accompanied by much higher volumes of fluid all happening in the heart of the Bakken formation, production profiles will continue to deviate to the upside from previous years projections. The choke sizing is, I’m virtually certain, publicly accessible through the ND DMR subscription service, as I’ve seen numerous references to specific choke size implementation in many wells in many plays over the years. Although this halo effect/hydraulic communication is somewhat ‘old hat’ to many, there is another intriguing factor coming into play. There is strong evidence that wells drilled into areas close to recently frac’d wells are encountering artificially (that is manmade) higher formation pressures. Interesting situation still being observed and evaluated. I’ve just tried to find out whether since 2015 there has been a general slower decline rate in older wells, which you would expect if newer completions have a stronger positive effect on older wells, than before. Right? I have not spotted any significant change, on the aggregate, so I am still doubtful about these claims. During the first 3 months of this year, older wells have declined a little faster than earlier years, on average (this may have been caused by more wells being put on TA). Thanks, indeed is it not too comfortable to view the site on a very small screen. I am not disagreeing with you that there may be some effect. I think you mentioned the case of certain XTO wells, that got an uplift. You will only see a partial well profile of the 3 remaining wells, as XTO took over these wells from another operator (in the next update I will have a better solution – it will show the complete profile). But what is interesting is that a couple of months ago, they did get an uplift, and according to fracfocus they haven’t been recompleted, so this may indeed have come from the completion of a nearby well, as I belief you have mentioned some time ago. It will be interesting to see how long this effect can last, and what the total size will be. The well profiles of the 7 nearby wells that got completed in 2015 are rather strange. So far the flow rate has kept increasing (on average) over 8 months for all 7 wells. You can see that if you filter on: first flow = “2015”. I guess that must have been a pretty heavy frac. But, as far as I can tell, this effect isn’t very widespread, as otherwise it would show up more clearly in a reduced decline rate of older wells, which is not visible. Tonight was the first occasion I’ve had to more completely access this site (from my laptop) as I almost always use my smartphone. As you are aware, the mobile device format is somewhat incompatible with your work. Great site. Lottsa time and effort have clearly gone into this. Without wanting to sound like a broken record, this ‘halo effect’ would only be detected on a well by well basis using the fracture dates and seeing increased production from nearby (offset), already producing wells. The Gis map would need to come into play to precisely place the wells’ locations. On one of Filloon’s posts, two wells were on the same pad but drilled in opposite directions. Increased output occurred in the older well (along with more produced water), but not as dramatic an increase as many other pairings. The thing about this, these wells are being drilled MUCH closer together, (600’/750′), so the higher induced pressure from the new frac is pushing more oil and gas out the older nearby wells. This process may continue well into the future. Burden of proof is on the halo effect advocates, not the skeptics. I remain doubtful as there are no company discussions of this, trade papers, studies, or analyst reports. And many other topics routinely get discussed so (DUCs, divertors, slickwater, etc.). The only place I see this discussed is at Oksol’s blog. And he is a nice guy, but not a strong analyst. Show me, show me, show me. I’ll believe it when you show me. So far, nada. P.s. And don’t confound general improvements in completions (heavier fracs, slickwater, careful geosteering) with halo effect. They are different topics. The former will show advantages in isolated wells; the latter requires an interaction. P.s.s. Zipper fracs are an interesting topic which have been written about, but are a little different than halo effect concept (idea that new frac adjacent helps old well nearby). In zippers, both fracs are being done near simultaneously. Oh…and the articles are not clear how much of benefit is truly to production versus just being a cost savings from more efficient use of the crew’s time. Gotta thank you for prompting me to spend some time on an ultra granular level of number crunching with a handful of wells, specifically the XTO Bear Den Johnsrud Federal wells and the nearby Bully Federal wells. Permit #s 17909, 19273, 25260 and 25262 are especially enlightening. Should anyone go over the production profiles, including produced water, from, oh, say the last six months of NDIC data, it is eminately clear that nearby fracs increase offset output within certain parameters (doubling and tripling in the stated wells), this is a big reason why these wells have slowed, arrested, and, as you noted, Enno, even increased output. Give me an analysis of the old wells. show me a t test versus comparables. Make sure to deconfound for the effect of just getting a little bit of pentup production from the shutin. You just keep asserting and don’t present any charts or data. I never have nor ever will be an unpaid internet research intern for anyone at any time. Contrary to your apparent reference to my being a ‘halo effect’ advocate, I care nothing what others misperceive concerning my postings. Should you decide to spend some time perusing the publicly available monthly production data from the NDIC, zeroing in on the XTO wells in the Bear Den field as described above, you – or anyone – will clearly see the dramatic increase in output from older wells coincident with the fracturing of new ones. Or … you could wait until someone comes along and states this in some more ‘established’ forum. Slowed and arrested their production declines. This is occurring pretty frequently.